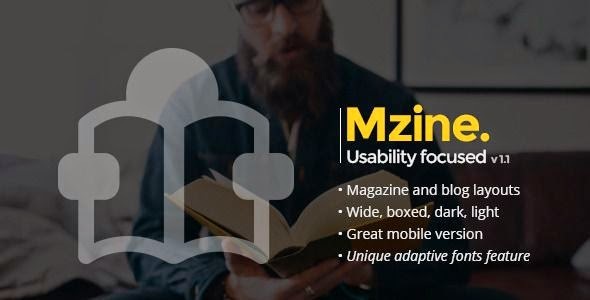 Mzine is a modern usability focused multipurpose responsive HTML template for online magazine, newspaper or personal blog. This theme is full responsive and works in all devices. It has beautifully design 14 pages. You can use it for many purposes: news key events, tutorials and so on. To get support please send us an email through the contact form on our profile page. Products get maintained with improvements and bug fixes. Menu, submenu and 2 versions of Megamenu. Take full advantage of modern web technologies. Semantic HTML markup and standards compliant CSS. Tested on Windows (Chrome, Firefox, Opera, IE9, IE10, IE11), Mac (Safari, Chrome, Firefox, Opera), iOS (iPhone, iPad) and Android. Item Reviewed: Mzine Multipurpose Responsive HTML Template (News & Blog) 9 out of 10 based on 10 ratings. 9 user reviews.